You need a computer with speakers and internet access. When you registered you should have received an email with the GoToWebinar details. GoToWebinar is the audio / video platform we're using for this conference. The email contains a link to join the conference webinar, which will prompt you to install the GoToWebinar software. We recommend installing the software ahead of time. If you have any issues installing or connecting, please contact us at (800) 280-4400. We'll send a reminder email a day before the conference, with these same links and instructions. If you can't attend all or part of the conference, or you want to re-watch, registered users will have access to the recording at a later date. During the conference we invite you to ask questions. Most questions will be answered by the speaker at the end of each presentation, but you can ask them at any point during their presentation. 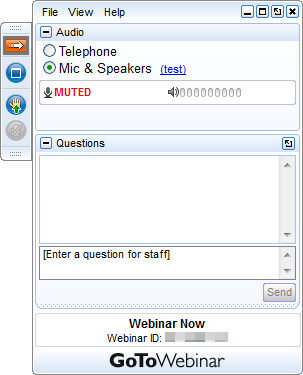 To ask a question, open the GoToWebinar control panel (unless it's already open) by clicking on the orange arrow at the top right of your screen. At the bottom of the control panel, enter your question in the Questions field, and click Send. Example of GoToWebinar control panel. If you didn't receive the email with GoToWebinar link and instructions, or if you can't find the email, please contact us at (800) 280-4400. Make sure your speakers are on and your volume is adjusted. You may need to adjust your volume throughout the day. If your speakers and volume are on, but you still don't hear anything, make sure Mic & Speakers is selected in the GoToWebinar panel at the top right of your screen. If you don't have speakers or headphones, you can still listen to the conference by calling a phone number. The number will be available in the GoToWebinar control panel, once you've joined the webinar. If you have internet issues, we recommend using a hardwired connection since the webinar could be affected by a slow or weak wifi connection. Want to be a sponsor? Contact us for more details. Want to be a partner? Contact us for more details. ServeCon is an online conference offered to all members of the process serving profession. Covering all aspects of running a successful business - marketing, technology, software, operations and legislation - this is the conference for you. Presented using remote conference technology, ServeCon gives attendees access to engaging speakers and educational session from the comfort of their home or office. Don't worry about the cost of travel and lodging, because we’ll bring the most relevant industry speakers to you. ServeCon is all about education and improving your business. We might even send some goodies your way for that conference feel!